Patna, April 17: Bihar Deputy Chief Minister Sushil Kumar Modi on Wednesday made some explosive claims about jailed Rashtriya Janata Dal (RJD) chief Lalu Prasad Yadav. 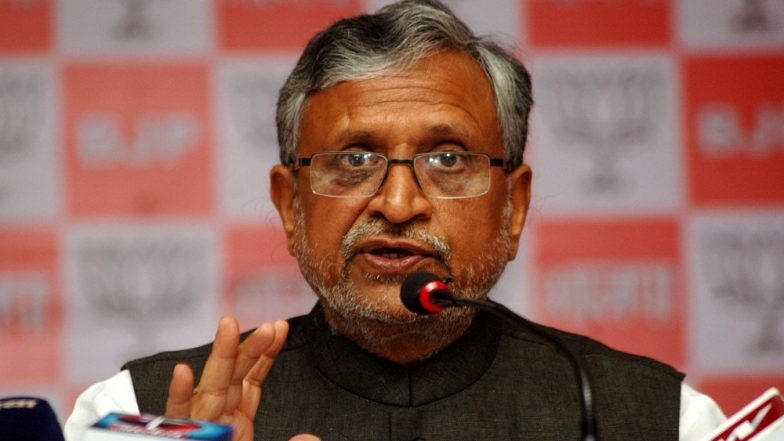 Addressing a press conference, Sushil Modi said Lalu Prasad had met Union Finance Minister Arun Jaitley and offered help to topple Chief Minister Nitish Kumar led government in Bihar. The Bharatiya Janata Party (BJP) leader had denied the offer. Sushil Modi said Lalu Prasad had approached Jaitley after the Central Bureau of Investigation (CBI) moved the Supreme Court against him in connection with fodder scam cases. "When Jharkhand High Court gave the verdict in favour of Lalu Yadav that there is no need for a trial in other cases related to fodder scam, the CBI went to Supreme Court challenging this decision," Sushil Modi said. 'RJD-JD(U) Merger', 'Nitish For PM, Tejashwi For CM'? Rabri Devi Says Prashant Kishor Reached Lalu Yadav With These Offers. "When CBI went to Supreme Court, Lalu sent his messenger Prem Gupta to Arun Jaitley, asking to not let CBI appeal to the Supreme Court in the case. He said that if they get help '24 ghante mein Nitish Kumar ka ilaaj kar dunga'," the Deputy Chief Minister claimed. "Later Lalu Prasad Yadav and Prem Gupta, both met Arun Jaitley and offered to topple Nitish Kumar government. Arun Jaitley clearly said that we can't interfere in CBI's functioning," he added. Lalu Prasad, in his forthcoming book 'Gopalganj to Raisina: My Political Journey', has said that Nitish Kumar wanted to quit the National Democratic Alliance (NDA) and rejoin the grand allaince. He has stated that Nitish Kumar sent JD(U) vice-president Prashant Kishor five times with the offer, the claim which was rejected by Kishor. "Kishor seemed to indicate that if I were to assure in writing my party’s support to JD(U), the latter would pull out of the BJP alliance and rejoin the Mahagathbandhan (grand alliance)," the former Bihar Chief Minister said. "Though I was not bitter with Nitish, I had lost trust in him completely. Moreover, I was not sure how the people who had voted for the grand alliance in 2015, and the other parties that had united against the BJP all over the country would react if I accepted Kishor’s offer," he has said. Nitish Kumar, who had joined the grand alliance ahead of the 2015 assembly polls, had become chief minister despite winning fewer seats than the RJD. Two years later, he quit the grand alliance and formed a new government with the support of the BJP.